Start analyzing alternatives and testing your own strategies with our powerful interactive investment tools. Try out your investment ideas. 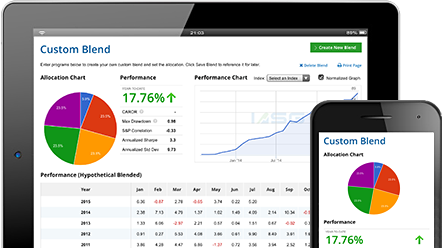 Our custom blending tool makes it easy to combine programs, set allocations, and estimate returns. Build your dream portfolio of managers. All its takes is a click to add programs, view historical returns, and track current values.